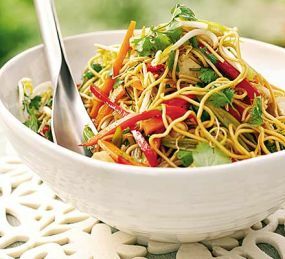 Stir Fried Noodles is a Cambodian Food Recipe with vegetables. In a large nonstick skillet, heat the oil with the sesame oil. Add the snap peas, carrots, red pepper, red onion, and green onions and season with salt and pepper. Stir-fry the vegetables over high heat until lightly browned in spots but still crisp-tender, about 3 minutes. Add the noodles to the skillet and stir-fry over high heat until softened, about 2 minutes. Add the rice vinegar and orange juice and continue stir frying until the noodles are incorporated about 2 minutes.